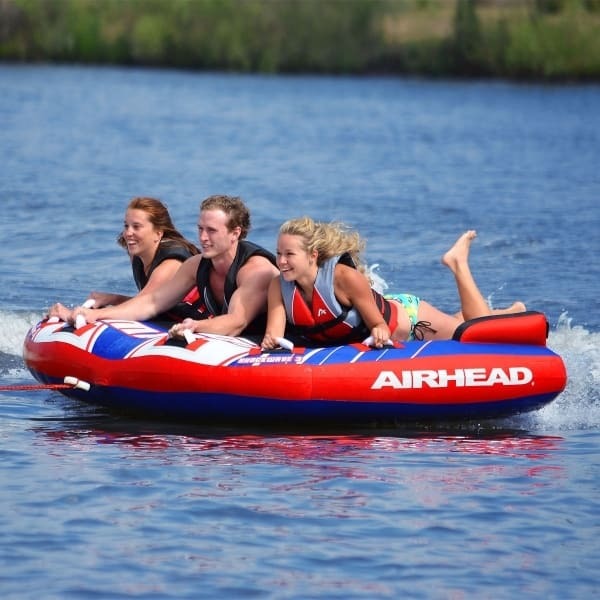 The Airhead line of inner tubes and water sport towables feature new and exciting designs that deliver new inner tubing experiences. The same old round donut that you’ve been whipping around your lake for years may be growing old. Or, you may be entertaining guests more this season than ever before. Give your kids, friends and family something new to enjoy on the open water. The Airhead Shockwave features a unique design with stabilizer fins to keep riders separated and safely aboard the watercraft. They extra support allows for more daring and exciting rides. The Shockwave 3 Rider is the largest of the Shockwave collection, seating up to three riders comfortably. The Shockwave features deluxe nylon wrapped handles that feature knuckle guards, a convenient inflation and deflation Speed Safety Valve, and a center and cover that are made to last for years to come. The center bladder is a tough heavy gauge virgin vinyl bladder, and it is covered with durable double stitched nylon. Enjoy the Airhead comfort and innovation that lasts!